Since my little one had declared he do not want Poha and Upma in his lunch box, as two of my sure options are gone now, I am always trying out varieties of rice. My criteria for a dish to qualify for his lunch box are simple - it should be manageable for him to eat independently, should be easy and quick to make, tomato/onion should not be there is visible form :), should be healthy, and should be a sure one..i.e. 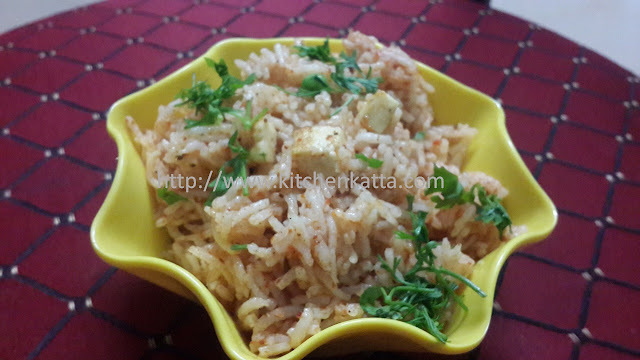 I need to be sure the box will come empty..
Well so with all these conditions, this Paneer-Green peas Pulav is our favorite one, not only for lunch box, but otherwise also whenever I have paneer at hand. Try this in your kids box and see the smiling faces back with empty boxes.. I am giving portions for a small size lunch box, you can scale it up as per need. 4. Heat oil in a pan, add jeera and add green peas. Saute it for a min. 6. Add pav bhaji masala, salt and sugar. Mix well. Add fried paneer pieces. Yummy Paneer-green peas Pulav is ready go in the boxes(or directly to hungry tummies)!! Optionally garnish with chopped fresh coriander.